Borussia Dortmund sporting director Michael Zorc has issued a transfer update on Jadon Sancho. The England sensation has been strongly linked with a move to Manchester United this summer following a terrific breakthrough season in the Bundesliga, in which Sancho has scored 8 goals and created 12 assists, as per WhoScored. Formerly of Manchester City, Sancho has been one of the standout performers in Germany this season, boosting spirits for the future of English football. Understandably, Borussia Dortmund don’t want to lose one of their best players but they lose time year after year anyway. It’s inevitable when bigger clubs come knocking for their best talents on a yearly basis, but that’s also how their operate with a business model. They’re already losing USA star Christian Pulisic to Chelsea after agreeing to sell the winger for £57.6 million in January, as per Sky Sports. “I’m far from putting a price tag on Jadon, but I will say that, even for the biggest club in the world, his transfer would be difficult right now,” BVB sporting director Zorc said, as quoted by the Manchester Evening News. Dortmund cannot appear weak ahead of the summer transfer window. They want to look strong and make it clear they won’t be bullied by any bigger clubs. But the Evening Standard previous claimed that United are ‘confident’ they can sign Sancho this summer. The Independent also went heavily with their story to suggest the teenager has become United’s prime target for the summer market. For Sancho, he’s getting plenty of game time and won’t feel a transfer must happen this year. The winger could be convinced to remain at BVB for another season to further develop his game in Germany. Though it’s not as if the England international would struggle to get into Ole Gunnar Solskjaer’s side which lacks a specialist right winger. 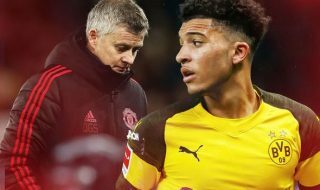 That’s the reason United have reportedly made Sancho their prime target.